Directed towards different kinds of skin problem, the most effective way is to enjoy facial masks with different functions. Maskerade PRO - Organic Mask Maker can provide you a high quality, multifunctional and safe mask which is made with adequate nutrition. You can DIY your facial mask with fruits, vegetables, milk and minor cereals. Facial skin can absorb different kinds of nutrition from fruits or vegetables. Maskerade PRO - Organic Mask Maker can provide you green skin care, whitening skin, restoring skin flexibility and vitality. 100% Natural Collagen Essence Facial Mask Maker. No preservatives, no lead, no mercury or other irritating substances. Safe and healthy, no side-effect. Making the facial mask by yourself can provide the safety and high-quality of the facial mask to achieve the best effect of skin care, tightening your skin and recover its elastic for your beauty. DIY various kinds of facial mask by pouring the juice of the fruit and vegetable, or tea, milk, honey, red wine, essential oils, herbs, etc. Will help your skin more healthy, clear and elastic. Also working for pores deep cleansing, blackheads whitehead acne removal and moisturizing. Maskerade PRO - Organic Mask Maker can provide you green skin care, whitening skin, restoring skin flexibility and vitality. Making the facial mask by yourself can provide the safety and high-quality of the facial mask to achieve the best effect of skin care, tightening your skin and recover its elastic for your beauty. 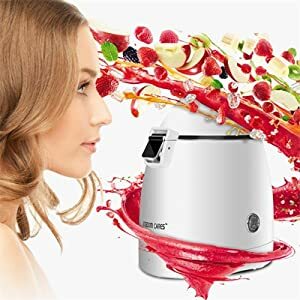 One touch operation after pouring pure water and juice, simple and convenient. And please prepare 20ml juice before making the mask, and mix the juice with the water in proportion according to the instructions. Lift cover design makes cleaning and maintenance simpler. Step 1: Place on a flat surface. Step 2: Pour materials toward the tank. Step 3: Close the lock catch cover. Step 4: Plug in power supplies. Step 5: Turn on the appliance. Step 6: Wait about 6 minutes. Step 8: Wait for 2 minutes to condense. Step 9: Use the scraper to get the mask. Step 10: Put the mask on your face. The best way to choose a completely appropriate mask is to make it by yourself. Most Easy, economical and convenient way to do a safe make at home. Save both time and money. So lately I've been looking for natural and organic ways on maintaining my skin I don't like chemicals on my face since my face is very sensitive and breaks out in hives so I bought this to give a try and add to my spa day not only is was it fun making it because i knew exactly what was in it but and i got see a fruit mask. The package was delivered straight to my door everything was in good condition and worked properly. You only clean the inside I used a baby bottle brush cleaner to gently clean it and just used a dried towel to clean the outside since you do not sumerge it in water. Love it! I can save a lot of money buying this mask maker & making my own facial ingredients. I pure my DIY liquid potion into it and it won't drip all over my neck. Leave it on for 15-20 minutes until it dries out, and then peel mask off. I'm very pleased that I received it earlier, and start makes my own face mask. DIY different pure fruit and vegetable face mask can keep my tired skin lively and healthy. I really like it and will recommend to anyone. Arrived quickly. Works fantastic. 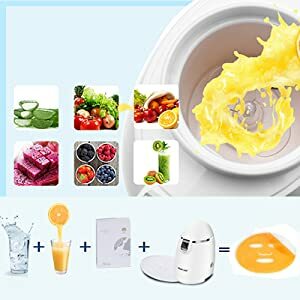 One touch operation after pouring pure water and juice, simple and convenient. At first I don't know how to use it, and I follow the instruction manual and the video, I find that it is easy to use. Just prepare 20ml juice before making the mask, and mix the juice with the water in proportion according to the instructions. 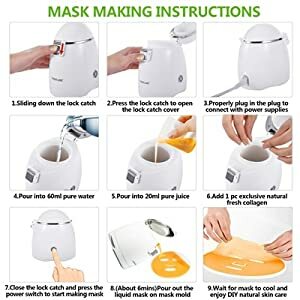 Pure them into it and wait about 6 mins and pure it on the mask maker set, it is OK. Just so amazing design and machine, I love it and many of my friends love it too. Great machine , highly recommend it. Love this product! It works just as expected. Very light and easy to store & clean. I look forward to using it all the time. Love this mask machine, with nice design, so attractive! Making the facial mask by me can guarantee the safety and quality of the facial mask to achieve the best effect of skin care. Also working for pores deep cleansing, blackheads whitehead acne removal and moisturizing. 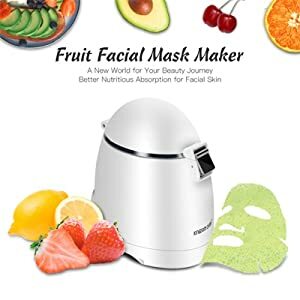 So I love this mask machine, it helped me to save a lot of buying mask money. Completely satisfied.